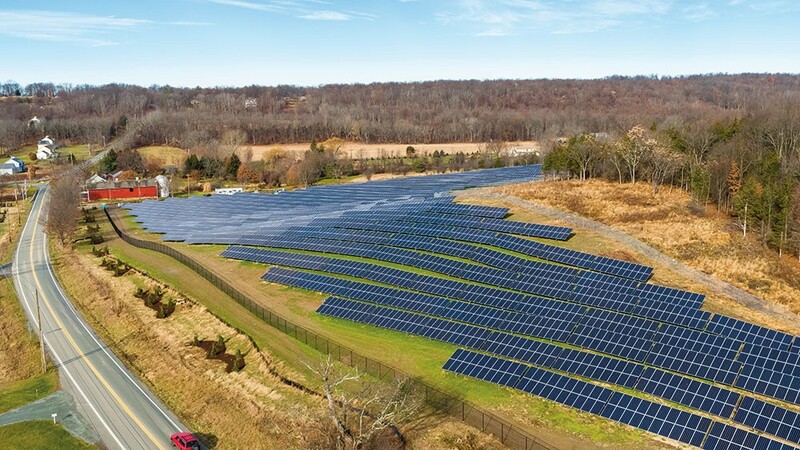 The Clearway Community Solar Farm in Minisink, New York is one of the largest community solar farms in the state. A quick drive through neighborhoods in the Hudson Valley could reveal arrays of solar panels—on roofs here, in fields there. 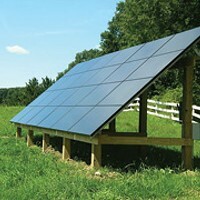 Clean energy efforts are definitely seen more often in the region, thanks in part to various state initiatives and solar panel-leasing programs, but tree cover, sunlight levels, and home orientation (not to mention cost of installation and maintenance) can be barriers to entry for rooftop solar. And one alternative— green energy products from service companies or ESCOs—have scared off many customers with variable energy rates, especially after the initial contract term. So what options remain for a homeowner who wants to do their part for renewable energy but is also looking for convenience and practicality? Clearway Community Solar is spearheading an accessible alternative by developing local Community Solar, sometimes known as shared solar farms. The company builds and operates Community Solar farms, including some of the largest ones in the nation, which local Hudson Valley residents can subscribe to, and then earn solar credits for their utility bills. Residents start with a customized consultation with a solar specialist to learn about the program's environmental impacts, and how home usage, in tandem with solar production, could render energy savings over time. "Our specialists look at historical energy usage to determine what portion of the farm makes sense for the customer," says Krishna Patel, director at Clearway Community Solar. "We want to provide a rate that positively impacts their energy costs for the long term." After the free consultation, the customer receives a quote for the subscription cost they would pay Clearway Community Solar monthly in exchange for the solar credits generated by the assigned portion of the farm. 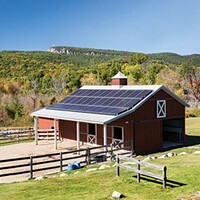 Once a homeowner subscribes to the program and the farm is active, these solar credits show up as a line item deduction on their utility bill. The goal: as utility costs can be unpredictable and could rise over time, the Community Solar rate structure and solar credits earned contribute to a more stable, and potentially reduced, utility bill. "The model is similar to community supported agriculture. By subscribing, you are supporting the viability of the local solar farm and clean energy generation for the local community," says Patel. "And like a CSA, your basket [i.e. energy credits] might vary every month, based on production and the time of year." The program is designed to account for the ebb and flow of sunlight and thus solar energy output, along with variances in a customer's home energy usage. With these fluctuations in sunlight and home energy usage, the potential energy savings are cumulative and seen over time. In the event of surplus solar production, when customers are left with more solar credits than can be applied to their utility bill, the solar credits roll over without expiration. "We want to make sure people understand that we are not putting anything on their home and that the energy produced is going directly to the power grid itself, increasing the share of clean energy generated in the community, and reducing the share of fossil fuels," Patel says. Clearway Community Solar just finished construction on their first New York solar farm in Minisink—the largest Community Solar farm in New York State with 16,000 solar panels that will generate 5.9MW a month, activating very soon. While the Minisink farm is at its subscription capacity with thousands of residents and businesses enrolled, Clearway Community Solar has six more Community Solar farms in development in Dutchess, Ulster, and Greene Counties. "Enrollments are actively coming in for all of our farms. It's exciting to see so many residents support the environment and feel like they have a way to make a difference," Patel shares. "If you have signed up and secured a spot on the farm, you don't get billed until the farm goes live. We make it a point to keep our customers updated, sharing what farm they've been assigned to, and sharing pictures and videos along the way. It's fun to see the Community Solar farms and know that you are part of what's behind it." Clearway's Community Solar program helps insulate residents against fluctuating utility costs by providing a stable price structure. Historically, utility rates rise. And in New York state, they can be different from month to month, adding to the variability. Clearway Community Solar's subscription rates for the solar credits are locked in for the contract term, and are designed to hedge against the unpredictability of utility rates. The results are seen in aggregate over time. Another advantage of Community Solar is convenience. "Because Clearway manages and operates the solar farms, a customer's rooftop, and time and effort, are removed from the equation," notes Patel. "The program is hassle-free, without home installations, inspections, upfront costs, or ongoing maintenance, and our operations experts manage and maintain the solar farms effectively, throughout any kind of weather." Aside from adding considerable renewable energy to the power grid, Clearway Community Solar is also supporting other supplemental environmental measures at their farms throughout the country. At their Farmington, Minnesota operation, the business invested in planting pollinator-friendly seed mixes and mature plants under and around the solar panels. This Minnesota solar farm also has honey bee apiaries to promote the pollination of the plants, making it an important model for both energy and agricultural sustainability. "New York State has huge goals around shifting reliance to cleaner energy," Patel points out. He is referring to Governor Cuomo's 2016 initiative: the Clean Energy Standard, which mandates that 50 percent of New York's energy supply come from renewable sources by 2030, dubbed the "50 by 30" program. "To meet that goal, residents will have to adopt solar. What we love about this program is that it offers a convenient, practical way to make the shift." To learn more, visit the Clearway website, or call (855) 813-5002 for a free, no obligation consultation.